UPDATE: Blandford is no stranger to crime. On August 13, he was jailed and released (made bail) for 2nd degree burglary, 4th degree burglary and theft. This was only the most recent of 12 separate CRIMINAL cases dating back to 1981! UPDATE: From The Capital. Police said Theodore Nathaniel Blandford, 51, of 279 Ella Welch Way in the Boone’s Mobile Estates in Lothian killed the two women before fleeing in a sports utility vehicle. When they arrived, officers found Blandford’s estranged wife, Sheena, 50, and her sister, Cheryl Timmons, inside the residence. Prince George’s County Police were assisting Anne Arundel County detectives searching for the suspects in Largo when they spotted the suspected SUV and tried to stop the vehicle, but it sped off and a chase ensued. The chase ended in southeast D.C. at the intersection of Minnesota Avenue and East Capitol Street where police said Blandford got out of the SUV and attempted to flee on foot. Police say that after Blandford fired at them during the foot chase, they fired back and struck him. Police said he died a short time later at a Washington hospital. UPDATE: From The Washington Post. Arundel police had good information that the suspect in the slaying lived in Upper Marlboro and asked the Prince George’s police to investigate the suspect. When Prince George’s officers arrived at the suspect’s home, he fled in a car into the District. The suspect suddenly stopped and exited the vehicle armed with a gun and attempted to flee on foot when Prince George’s County police officer(s) shot him. UPDATE: From MSNBC apparently the suspect in the homicide fled the scene and was critically injured by a Prince Georges County police officer when he was shot in the District of Columbia. UPDATE: Police confirmed it is a double homicide in the 200 block of Ella Welch Way in Lothian. 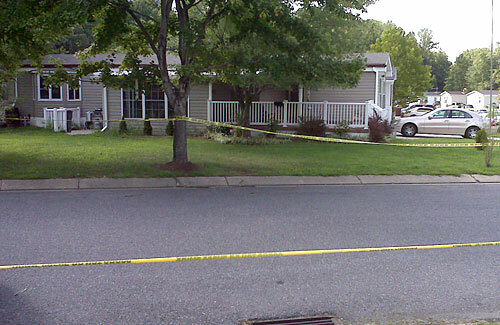 The Capital is reporting that police are on the scene of a double homicide in Lothian, MD. Details are sketchy at this point. Story developing.